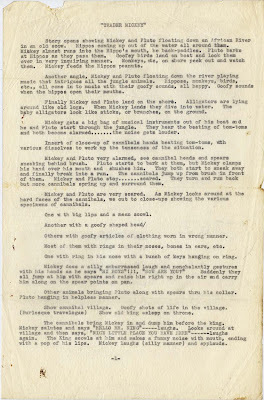 TRADER MICKEY was released in 1932, and sees Mickey captured by cannibals. Not one of the more politically correct shorts. 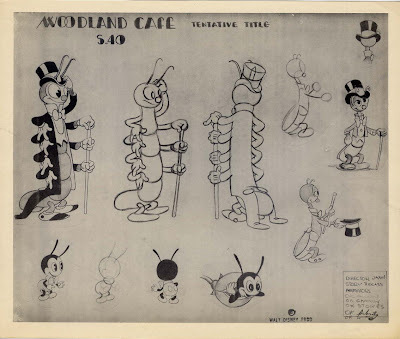 Some of the early Mickey shorts are really quite interesting in their scope and material, first they simply cashed in on synchronization to music and then they became mini adventure films spoofing the popular features of the day. My guess is that TRADER MICKEY was a parody of the MGM film TRADER HORN of 1931. Here is the first page of the story outline. Anybody know where I could maybe find the second page? Recently I was talking to my wife about how dull modern cartoons are, I don't mean films from PIXAR or others, but regular TV cartoons. 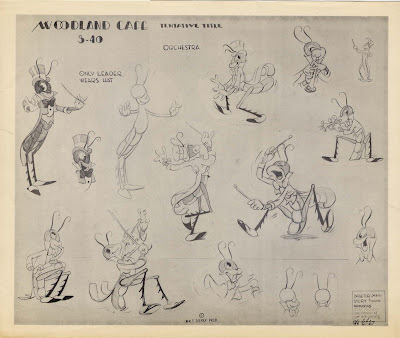 One of the truly appealing things about classic animation is it's use of music, from Disney's SILLY SYMPHONIES, to LOONEY TUNES and even the great TOM & JERRY shorts. Music really drove the action in those films, and it's a real shame that TV animation is only about making a quick buck or mimicing bad anime these days, ANIMANIACS in the mid nineties came close. Anyhow, one of my absolute favorite SYMPHONIES is WOODLAND CAFE and I just had to pick these models up a month or so ago. 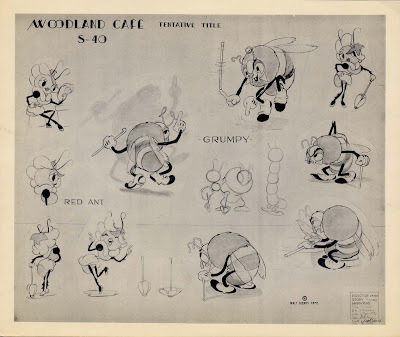 We are all familiar with the work of UB IWERKS, his animation and his technical innovations, but what about his work on the first Mickey comic strips? A few years ago this fantastic piece of original art was offered on an e-bay live auction, unfortunately it was a little beyond my price range. This is the 15th instalment of the Mickey daily strip. Does anybody know of any more original artwork being out there? I am influenced by a lot of different films, books and art, especially classic comedy like Chaplin, Keaton, Marx Brothers and Laurel & Hardy. Another photo I just acquired is this wonderful shot from the 1932 academy awards when Walt won for FLOWER AND TREES and Laurel & Hardy won for their classic short THE MUSIC BOX. 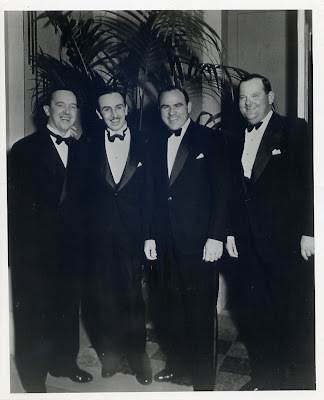 That's Hal Roach, Laurel & Hardy's producer on Walt's left. It's been a hectic week since returning to Sydney, with two films to storyboard the blog has had to take a back seat. Getting home was wonderful, especially when opening up my mail and having a look at some of the new pieces to my collection. 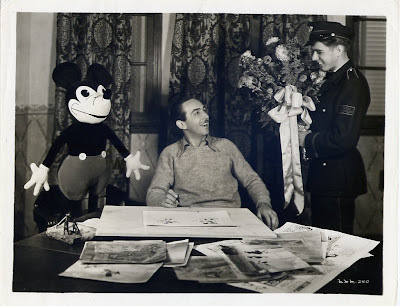 With MICKEY MOUSE's 80th anniversary coming up I thought it would be great to share this new photo first. Accoding to information on the back, this photo was taken for MICKEY's 5th birthday and was taken on October 28, 1933 (not quite MICKEY's birthday). Over the coming months I hope to share some of my experience working with MICKEY on THE THREE MUSKETEERS video, I know that it is far from the greatest MICKEY film but believe me the film released was not quite the film I saw on the story reels. But it was an honor to work with such an important character just the same.